Arab leaders papered over long-running regional rivalries on Sunday to condemn a U.S. move to recognise Israel’s sovereignty over the Syrian Golan Heights and said stability in the Middle East hinged on creating a Palestinian state, Reuters reported. Arab leaders, attending a summit in the Tunisian capital, have been grappling with regional splits over Iran’s influence in the Middle East, a bitter Gulf Arab dispute, international pressure over the war in Yemen and unrest in Algeria and Sudan. But they have found a reason to unite against President Donald Trump’s decision to sign a proclamation last week recognising the Golan Heights as part of Israel, which annexed the area in 1981 after capturing it from Syria in 1967. It follows a U.S. move less than four months ago to recognise Jerusalem as Israel’s capital, a decision that also prompted Arab condemnation. Palestinians want East Jerusalem as the capital of a future state in the West Bank and Gaza. Saudi Arabia’s King Salman bin Abdulaziz told Arab monarchs, presidents and prime ministers at the start of the summit that his country “absolutely rejects” any measures that affect Syria’s sovereignty over the Golan Heights. 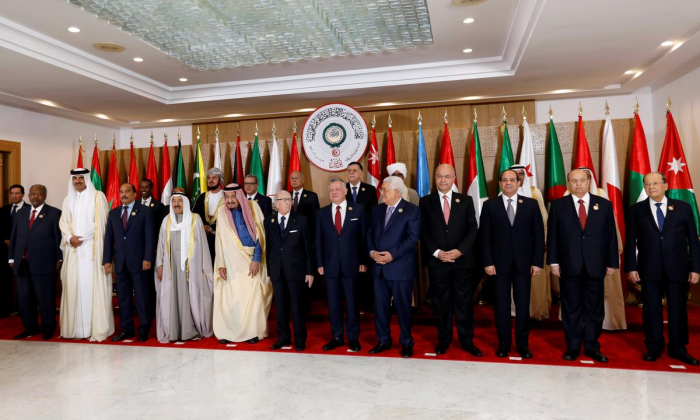 His remarks echoed those of senior Arab officials before Sunday’s summit of the Arab League, which usually ends with a final declaration agreed by the 22 member states. U.N. Secretary-General Antonio Guterres, who addressed the meeting in Tunis, said any resolution to the Syrian conflict must guarantee the territorial integrity of Syria “including the occupied Golan Heights”. Summit spokesman Mahmoud Al-Khmeiry had said before the summit that Arab states would also repeat a call offering peace with Israel in exchange for occupied Arab lands and would reject any initiative not in line with U.N. resolutions. Despite a show of unity in rejecting U.S. initiatives that support Israeli policies, Arab states remain divided over a range of other issues, including pro-democracy protests that have erupted in the region since 2011 and over Iran’s Middle East influence. King Salman, whose country has long vied with Iran for influence, called for confronting what he called the “aggressive policies of the Iranian regime”. He said Iran was interfering in Arab affairs, a charge Tehran has long denied. The Tunis summit brought together the rulers of Saudi Arabia and Qatar for the first time at the same gathering since 2017 when Riyadh and its allies imposed a political and economic boycott on Doha. Saudi Arabia and its allies accuse Qatar of supporting terrorism and cosying up to Iran, an accusation Doha denies. The leaders of Sudan and Algeria did not attend Sunday’s meeting, with both nations roiled by anti-government protests. Abdelaziz Bouteflika, Algeria’s ailing 82-year-old president who has ruled for 20 years, and Sudanese President Omar al-Bashir, in power for three decades and wanted by international prosecutors for alleged war crimes in his country’s Darfur region, are both facing calls to step down.